What’s really real? Having brought hundreds of students to two nearby orphanages in southern China since 1995 with a plethora of memories – good news of adoption and connection along with tragic stories of separation and loss – I ask myself what really matters when one takes the long view? My teacher Cynthia Bourgeault recently challenged my thinking about the “really real” by sharing the Wisdom Tradition’s view on this question. She explained that the only truly permanent beings in the universe, according to this tradition, are those who have gained enough spiritual maturity to join what she calls the “conscious circle of humanity.” Their souls have grown to the point that they remain in the “imaginal realm,” a subtler energetic domain, as a resource for those who live on the earthly plane. All others return to their organic origins; from dust they have come and to dust they shall return. While it is not a shift I can say I have fully embraced, there is something attractive about the possibility that the only enduring souls are those who have purified their hearts to the point that love, compassion, and grace are their defining characteristics. And so during a busy three days of visiting children at these two orphanages, we prioritize a half day to visit Kuan Yin, the Chinese goddess of compassion, on top of a nearby mountain as an opportunity for our students to literally walk the bodhisattva path towards that which may be the realist thing in the universe. We bring our group of 40 to Xiqiao Mountain, a large volcanic mound that springs up from the flat Pearl River estuary about 70 kilometers southwest of the southern city of Guangzhou. As we enter the temple confines, I remind them of the previous night’s discussion of Joseph Campbell’s “Heroic Journey,” which teaches that each of us is called to leave our ordinary world of experience, enter into a special world to find some new insight, and return with an elixir to re-enliven our original world. Temples make this mythic pattern explicit, asking followers to leave the “profane” (literally “out in front of the temple”) world behind, enter into a sacred world, and bring back some healing balm into one’s daily existence upon their return. Inside the temple complex, we look to Kuan Yin’s own heroic story for inspiration. Originally, Kuan Yin was the male Indian god Avalokitesvara, who desired to help those who suffered. But these attempts left Avalokitesvara so heart-broken by what he had encountered that he shattered into a thousand pieces. From these broken fragments, the gods re-membered the deity. Not only did he become transformed into a female goddess, but now she was resurrected with a thousand arms, each with an open eye inside every palm. She became a long-eared deity who could hear the cries of all who call upon her name. 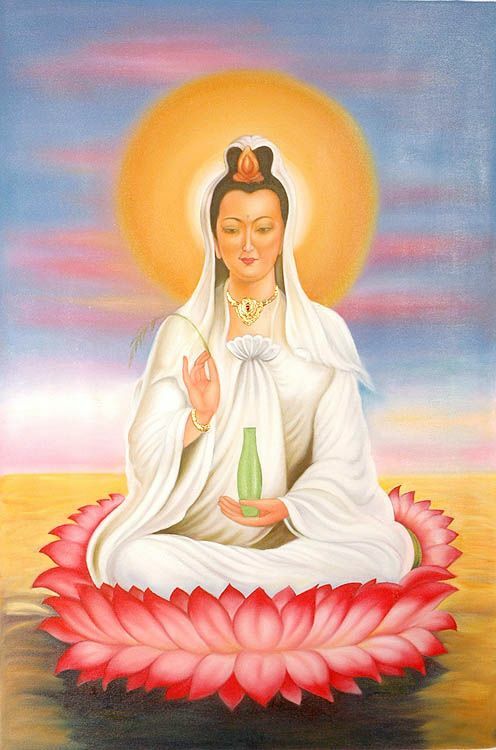 Suffering, I point out, heightened Kuan Yin’s capacity to see, hear, feel, and “lend a hand” to those in desperate need. This is the great teaching of Buddhism, I explain, that the heart can transform deep suffering into even deeper compassionate action. In the shadow of this giant statue, we gather in a circle to put this teaching into practice. I ask the students to write down three examples of suffering that they have observed at the orphanages so far this weekend. Then I ask them to assume a meditation posture, and in unison we breath in suffering and breathe out compassion. We attempt to put this Buddhist teaching into practice, seeking some empathic channel deeper than the pain we have witnessed. I tell them not to underestimate the challenges in this special world. I relate that six years ago we encountered a baby born only a few months earlier whose face was extremely drawn as if in a permanent grimace. When we asked what was wrong, we were told that the baby had not eaten in about ten days and that nothing could be done. Stunned and unsure how to respond, we stayed . . . A teacher came to the room and played acoustic guitar, and then several girls intuitively began a vigil accompanying the suffering child into his premature and final trial. Kuan Yin’s shattering is an apt metaphor for what the students experienced; the suffering we observe at these orphanages is real. Kuan Yin is known as a bodhisattva, one who has accumulated enough spiritual sensitivity to reach enlightenment, but who chooses to stay on earth for the sake of all sentient beings. In her left hand she holds holy water that she sprinkles on all who cry for help, while the mudra position of her right hand symbolizes a connection to heaven. Sitting atop a mountain looking down across the plain, she is herself a benevolent bridge linking heaven and earth, available to all. 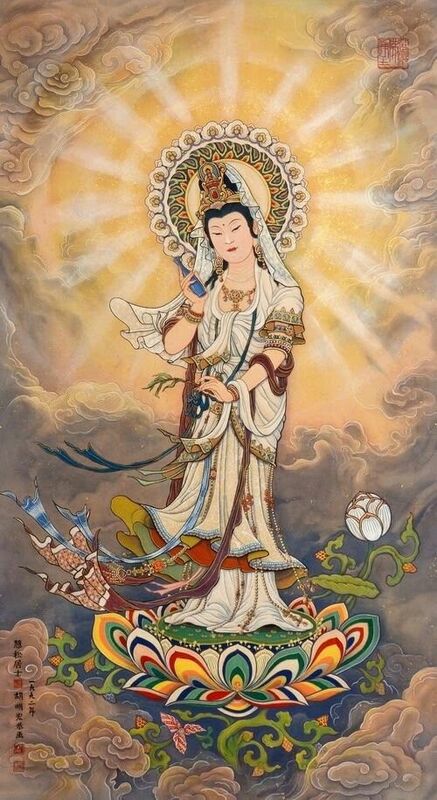 Kuan Yin models what Mahayana Buddhism’s millennia-long search has come to understand about the path of compassionate action. This involves habitually setting aside the natural human tendency to seek pleasure and avoid pain and instead opening up to suffering, even that which might shatter the self, trusting that something deeper will hold. The next morning we give our students a choice. They may return to the orphanage that takes outstanding care of its special needs children, or go to the one that seems stuck in a previous generation’s minimalist care mode. Whether the decision was consciously made in light of Kuan Yin’s example or not, the vast majority of students opt for the latter institution where suffering is visible and even shockingly raw at times. It is at this orphanage that we once again meet an 18-year old “boy” who lies flat in a bed – as he did four years ago when I first remember meeting him – wearing nothing but a diaper. Some thick brown growth lies like a partial beard on both sides of his face, and even more unnaturally appears across areas of his bare chest near his armpits. His arms are splayed behind him. He can speak and respond, but repeats the same simple phrases over and over again. A small group of students sits next to him and engages him in Cantonese. We help him do the one activity we can think of: we put a piece of paper behind and below his head where his right arm naturally falls, ask him to choose a color, place a crayon in his hand, and help him to draw. Every few minutes the students hold up his piece of art in front of his bent head seeking his approval, and then continue. On the last day we honor his one request, bringing him a piece of cake. When we finally leave on the last day, students are fully engaged with children to the last minute. We take our one group picture of the weekend and then say goodbye. Tears erupt from the children who so crave our attention; some of our students, too, find it difficult to leave. A range of profoundly deep feelings – sadness, grief, anger as well as joy, gratefulness, and warmth – accompany our departure. Dealing with these emotional realities is what it means to walk the bodhisattva path. We return to Hong Kong and begin to process the experience. When I ask students on day 2 and day 3 to give one word responses to how they are feeling about the trip, about 85% are what are considered “negative emotions:” sadness, guilt, helplessness, anger, confusion, disorientation. Certainly the bodhisattva path invites experiencing the suffering of others. As we begin reading the Chinese novel To Live by Yu Hua, which chronicles the sudden fall from wealth of a rich landlord’s son in the 1930’s, we further explore how to deal with suffering in such a way that one can become a wise person rich in life experience, self-understanding, and empathy. We compare the difference between the son’s ordinary self before losing his wealth to the Larger Self that emerges through a series of personal tragedies. A couple of days into the book, then, I use these terms to ask my students to reflect on their own experience in Foshan. Question: We returned from Foshan a week ago. 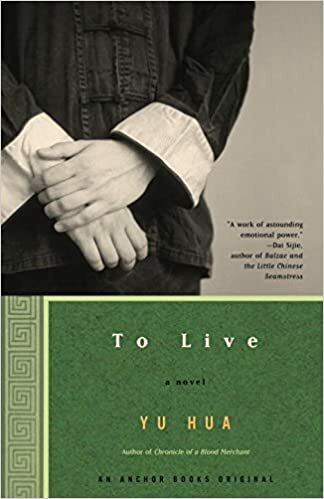 The whole experience can be symbolized by crossing the river in the narrator’s story: we all have a small self (ordinary world) that is challenged by certain experiences (in the special world) to become a Larger Self. What is the difference between the two selves that the Foshan experience offers you? Do you think you have changed in any way since the trip? What do you need to do to become more of that Larger Self? “Few cross over the river. Most are stranded on this side. Alex: I think before I went to Foshan I took things for granted. Just everything I had I didn’t think much of it. But when I went to Foshan, I got to see something I’ve never really experienced. It was eye-opening to see what types of conditions. See how much stuff they had compared to me was just crazy, and the stuff that we both had were very different for example my clothes or my bed. Now when I walk into my house, I am more grateful for what I have. I see more value and I am thankful that I have them. Andrew: Honestly, I think the trip changed me, but not in a drastic way. However, I think that I changed in two major ways: I realized that I was too materialistic and too entitled. When visiting the Foshan orphanage, I realized that these kids had no material possessions except for the clothes on their backs. I looked back at all of the expensive things I had back at home, and realized that few of them truly made me happy. I realized that I didn’t need a mountain of objects to make me happy. Experiences are what make us happy, not the latest blah blah blah $$$. The second way I changed was not when we were at the orphanage, but at the hotel. I realized how entitled we acted when at the hotel and on the bus, how we screamed on the bus and played loud music, how we ran through the hallways, ignoring other guests, how we wasted our last dinner without even caring. Annika: My old self would have continued being oblivious to the real world and the suffering. On my journey to becoming my new self, I realized that by showing compassion and showing that I care could make a huge difference in the life of the less fortunate. I believe that I have changed because of this trip and that I am one step closer to becoming my larger self. All I need to do is step out of my bubble and listen to the people in need. Ayaan: The trip to Foshan is one that I value a lot. The trip was eye-opening, I did not realize that there were people living lives like this without any control. I was not aware how bad the living conditions were at some of the orphanages. This was when I was realized I displayed the traits of that smaller self. I was selfish, inconsiderate, and lazy. I was not focused on anyone but myself, but on this trip, I changed. I realized how lucky I was and stopped taking things for granted, I value little things like food a lot more. I made an effort to become more of that larger self, to be more awake and use the opportunities I have been given to excel. Blythe: My old self was self-centered and selfish, I sought to help others only to gain something myself. I was unwilling to do work that would not benefit me. However, my new self has been able to shed that egocentric skin, which helped me see a lot of new things that I could learn from instead of just scratching at the surface of suffering. Instead of seeing sick children in a bad living environment that I did not wish to interact with, I saw individuals with their own tales of suffering that needed company and comfort. To become more of my larger self, I need to continue to do selfless service, keeping my barriers down at all times. By continuing to learn about and experience suffering, I will be able to stay awake. Daniel Z: Since the Foshan trip, I want to help out more in some way. One example of this, when I think about film projects I used to only think about narratives but now I really want to use film and videos to help people in HK struggling with poverty. I think that in order to become more of that larger self I need to actually begin helping instead of simply thinking about helping, since thinking doesn’t physically do anything for anyone or benefit the situation of any of the children in poverty. Henrietta: Since returning from Foshan, I have noticed a change in the way I perceive my surroundings. Before Foshan, I was unaware of all the things that I had in my life. I would envy what others had: a house bigger than mine, parents who would obey their child’s every wish, people who were born naturally very talented. It wasn’t until I saw people less fortunate than I that I began to notice all the privileges that I have been given. I realised that while I was too busy being jealous of what other people had, others were jealous of what I had. I have a home, I have access to good education, I don’t have to worry about whether or not I would be able to have a next meal; these were the types of things that I often took for granted while other people would wished desperately for them. Now, to become more of that larger self, I need to think about all that I already have instead of focusing on what I want. Jack: The difference between the two selves offered by the Foshan experience is that one self is self-centered and only wishes to benefit itself, whereas the other self desires to help others before itself….The trip did change me, I went from being closer to the first self to the second one. Since the experience, I have become more grateful for the opportunity I have been given that those orphans may never get. To continue to become my larger self, I will need to open up to more experiences similar to the Foshan. Jason T: Before the Foshan trip, I was tuned out to all the suffering in the world. Of course I was aware of its existence, but I didn’t actually know what it felt like. But through the Foshan trip, I actually got to see and experience this suffering first hand. Jason W: After the Foshan trip, I’ve become more appreciative of the things I have in life. My privileges, my family, my friends, list goes on. Before the Foshan trip, I would regularly think about what I didn’t have in life, and the things I had in life that I disliked and felt no appreciation towards. I realized the children in the orphanage would have died for to gain what I have, no matter how small or how big because they had the ability to appreciate. They didn’t have anything but some worn out playground equipment, each other, and some dirty plastic balls. Now, I’m becoming more and more appreciative of what I have and remind myself everyday. Josh: My worldview has changed a lot after Foshan because it’s made me more thankful and really opened my eyes. This was really eye-opening because there is a huge difference of hearing what’s out there and experiencing the horrible things that happened in Foshan. Every time I’m experiencing my type of suffering whether it was being sick or having a lot of homework, I remember how easy I have it compared to the orphans in Foshan. Being helpless glued to my bed when I was sick reminded me of Simon [a boy who has lain in bed for many years] in the orphanage, and I began to imagine how hard it must have been on him to be glued to the bed helpless not being able to explore and move around. When I was sick and glued to the bed, it seems like time passes by without you. I couldn’t even imagine how Simon felt and how he probably lost track of time. Laura: I went to Foshan with an awareness of suffering. I knew that some people in the world were in pain. What changed is my attitude towards this suffering. Before, I viewed suffering as a never-ending event. I didn’t know where to help, and opportunities, where I can help, were never offered. Foshan trip was my opportunity to help, and that really changed me. I left Foshan with a visual representation of suffering, the memories of those orphans stuck with me. I became a lot more appreciative of what I have, as I was visually reminded that others don’t have what I do. I need to seek opportunities to help, instead of waiting for opportunities to find me. Whether it be contacting charity organizations or simply researching online. Marisa: Before Foshan, I never really thought of people who had lives different than mine. I knew I liked to help other people but I never really focused on it and I wasn’t very interested in service trips. Once we were there in the “special world” I became my larger self and I had so much empathy for the children. As we spent time caring for the children I realized how much I wanted to do more for them. Now that I am back I want to be more involved with service trips and be less selfish in my decisions. Sam: Before seeing the orphans in Foshan I was selfish about my life because all I cared about were grades and homework. Now I have been to Foshan that cycle has been broken and I am realizing that grades aren’t the most important problem in the world. Sienna: Personally, the “ordinary self” is not being aware of all the suffering, in this case, in the orphanage in Foshan. When I initially arrived at the orphanage, I was much more naïve in the sense that I didn’t know much about the world around me. But, after Foshan, my “larger self” now realizes that there is so much more than just my surrounding and how grateful I am. Stephen: I went to Foshan already knowing that I need to appreciate what I have. I’ve heard the phrase “be thankful for what you have.” a countless amount of times, but I never understood it until I went to Foshan. I realized how different my life was from the orphans. Even the babies there were not getting enough care. I noticed many differences from the way I live to the way they live and it helped me understand how privileged I am. Taira: In the beginning of the trip, we were selfish and inconsiderate. The biggest problem in most of our lives was the grade on the last test. We were ignorant about the fact that there was suffering in the world, some of it very close to home. Once we reached the orphanage though, we became selfless, and fully immersed in serving others. I have to say, I was surprised about how well our class worked with the orphans. After the trip, I was able to look at the two selves: selfish and selfless. Once aware of the suffering of others and able to experience it, we were able to be compassionate and selfless. On the other hand, before we had been exposed to the orphanage, we were self-centered and ignorant about suffering. After the trip, I took a step back and just looked at myself. How lucky I am to be born into a well-off family with mom and dad who care for me, a private school education, and the love and compassion of my friends and family. Going to the orphanage sort of opened my eyes, and let me experience the world with kids who aren’t even close to as privileged as me. In order to become more of a larger self, I need to open my eyes to the suffering happening around me. I have to realize that I can’t seek pleasure or happiness in everyday life if I want to travel from my small self to my larger self. One week following the Foshan trip students have had a significant shift in perspective: a greater awareness of suffering, more appreciation of their privileges, and a potentially less self-focused life. The Foshan trip awakens students to the possibility of living with more awareness, gratitude and compassion. The goal for me as a teacher is to take this moment of realization and move students towards a permanent change in consciousness. When I tell students back at HKIS whom I had taken previously on this trip that I had just gotten back from the orphanages, their eyes widen as if their hearts have just jumped. There are numerous reasons for this I’m sure – the “high” of being with classmates for 4 days, memories of singing on the bus, the naiveté of being a freshmen before life got “serious” in the upper grades – but I believe that something deeper has stirred in them. As the student comments intimate, they seem to sense that Campbell’s heroic journey of going beyond ordinary reality and engaging the complex interplay of beauty and sadness in a special world applies to them. Simultaneously tasting the mixed blessing of experiencing the suffering of others and acting compassionately to alleviate this pain diminishes the self and its worries so as to be simply present to the very real lives of others utterly different from themselves. They have walked for a few days in what a whole tradition has determined is the most real entity in the universe, the bodhisattva path of compassion. Comment from Becky Mak in 2010 who went in 2006 and then again in 2010 about the central question that this trips raise about hope. On the bus home from the Foshan Orphanage, I realized happily that I was feeling the complete opposite of what my ninth grade self felt on her way back to Hong Kong. My experiences from my freshman year trip had evoked despair and distress in me. During that weekend in November 2006, I had spent all three days with mentally disabled orphans. At the end of the weekend, I was physically and emotionally drained and I could not stop wondering furiously about why such sweet children were spending their youth and teenage years in the dark and dank room. No matter how hard I looked, I could not find hope in their situation of having to grow up without the personal attention and care that all children need in their lives. Four years later, I stepped onto the same third floor that all the mentally disabled children live on. It took only a few seconds before I felt little hands pulling me and heard little voices calling “jie jie” (“older sister” in Cantonese). But instead of selfishly hogging my attention, the children who had reached me first were actually guiding me towards the other children who were unable to make their way to the door, so that my attention would reach all the children. The love the children showed each other, despite having rarely experienced it themselves, was overwhelming and inspirational. This weekend in May 2010 reaffirmed what I have learned since my first trip to Foshan four years ago: there is hope in this world – it lies within every single one of us, because we have the power to make a difference. I am no longer consumed by sadness when I hear about injustices of our world. I am now filled with a sense of duty to spread the love, and ultimately, the hope. 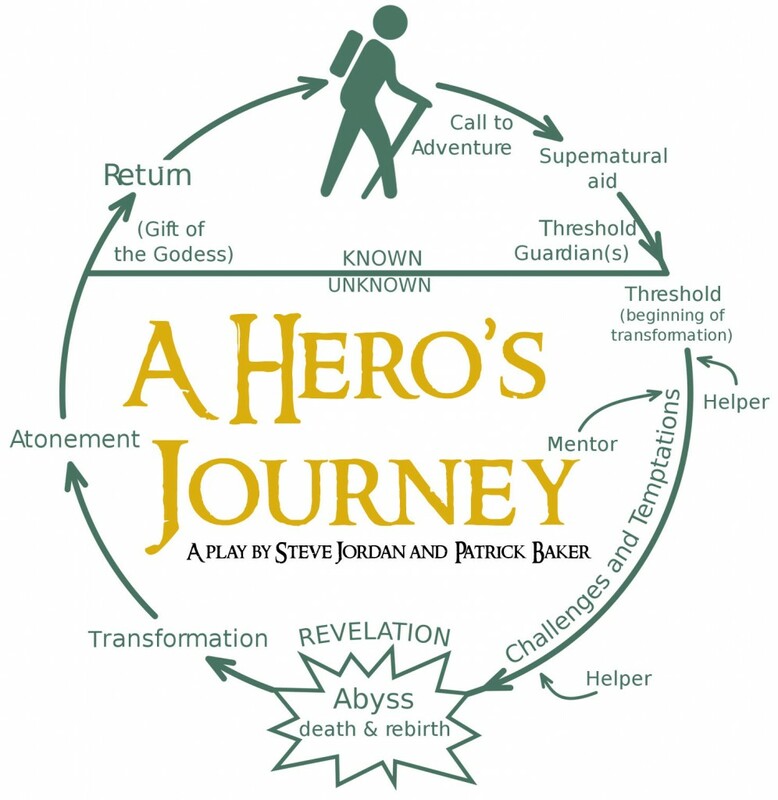 This entry was posted in Uncategorized and tagged action research, Buddhism, cynthia bourgeault, Foshan, foshan orphanage, Humanities I in Action, meaning of life, service learning, service motivation, spiritual practice, Wisdom Tradition. Bookmark the permalink.